Yes, the rental market has cooled way down recently as more apartments open. But only after rents here soared 155 percent over the last two decades, making Seattle and its suburbs one of the most expensive places in the country to rent an apartment. There’s been nothing but good news this year for Seattle-area renters, who have seen rent prices freeze while they get more and more open apartments to choose from and various perks like a free month’s rent offered by landlords. But that doesn’t mean Seattle is suddenly a utopia for apartment hunters. Just the opposite: Seattle remains one of the priciest places in the country to rent. 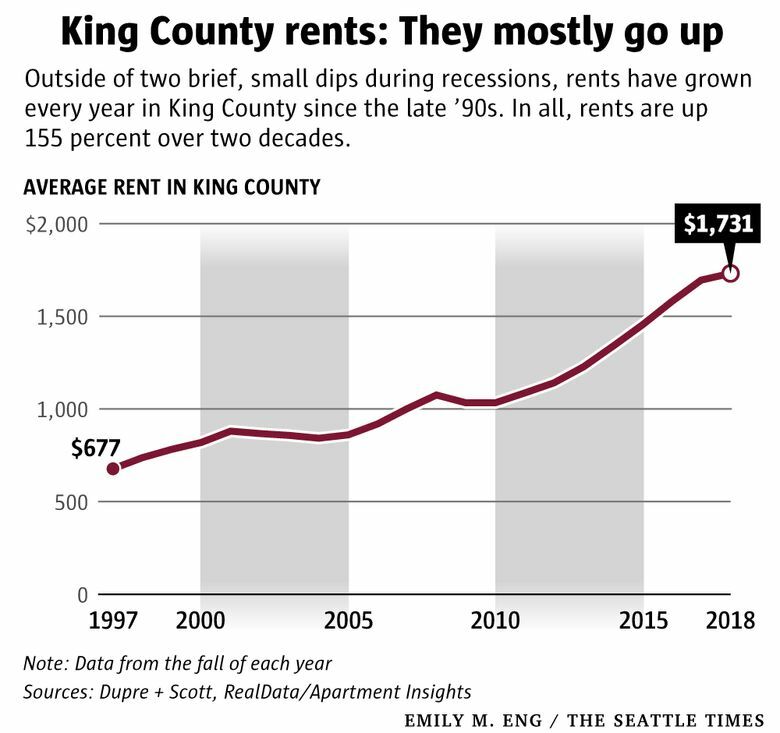 The lack of rent increases in 2018 comes only after seven straight years of large rent hikes that have made Seattle unaffordable to anyone not making decent money. Rents have grown even faster than home prices locally. And the reality is that rents are never going to plummet back to the days when you could get a sweet spot on Capitol Hill for a thousand bucks a month. It might be wishful thinking to hope for rents to drop more than a little, since that virtually never happens. 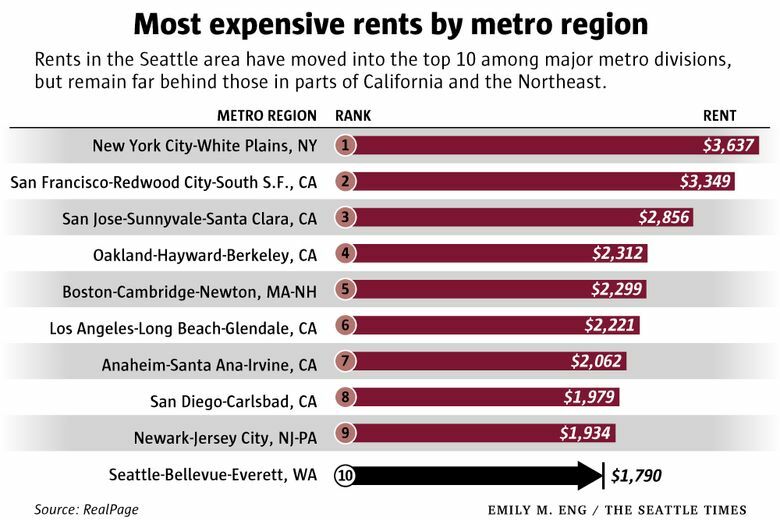 Looking at the 50 biggest regions in the country, the Seattle area is the 10th most expensive place to rent after surpassing Washington, D.C. in recent years. Outside of California – still the king of impossibly high housing costs – only the New York, Boston and Jersey City areas have higher rents, according to data compiled by RealPage, a real estate data analytics company. Those numbers represent averages across broad areas (in our case, King and Snohomish counties). Looking just at cities, Seattle proper also ranks 10th on the priciest rent rankings, having recently passed Honolulu. Seattle – both the city and the suburbs in the broader metro area – stands out on the national stage for how fast rents have grown; only a few places – like Oakland and Sacramento – have seen bigger rent hikes this decade. Rents have soared 69 percent across Greater Seattle since 2010, more than double the national average of 32 percent. Here’s the practical way of putting it: In 2010, average rents in the Seattle area and across the rest of the country were about the same. Now, our region is more than $300 a month pricier than the national average. On the high end, the cities of Seattle and Bellevue are now more than $500 more expensive than the national average. Some neighborhoods have seen even bigger jumps. According to Apartment Insights/RealData, which surveys landlords here, rents in Capitol Hill have nearly doubled from $1,060 in 2010 to $2,020 now. Both Bothell and South Seattle had rents of $980 at the start of the decade, and $1,720 now. East Bellevue? $1,080 then, $1,820 now. The good news for renters is that this year has finally brought an end to soaring rents, as a record number of new apartments open up, with more of them sitting empty. In theory, if more apartments keep coming (and they will be, at least through 2019) and there are not enough renters to fill them, it’s possible rents could start to drop eventually. A recession could add to that. But unlike the for-sale housing market, which can be volatile, rents very rarely drop, and when they do, it’s not by much. In the grand scheme of things, those small drops that come every once in a while don’t have much of an impact on how much rent you have to pay. When we haven’t been in a recession, rents here have grown an average of 6 to 7 percent a year since the late ‘90s. Add it all up and rents have surged more than 155 percent over the last two decades, overall. For now, the best thing renters can do – and yes, I’ve heard of this working several times in recent months – is to show their landlord the rental market stats, including the rising vacancy rates, new construction, and flat-lining rents, to try and counteract any proposed rent increase. Chances are the landlord already knows the numbers and is hoping you don’t. It costs time and money for a property owner to fill a place (I’ve talked with a few landlords recently who said it’s taking them weeks, and sometimes months, to rent open units – which means lost income), and this is the first time in a while that renters have had real bargaining power. RELATED: Read the latest news about residential and commercial real estate in the Seattle area and Pacific Northwest here. Recent stories about rents and apartments are below.